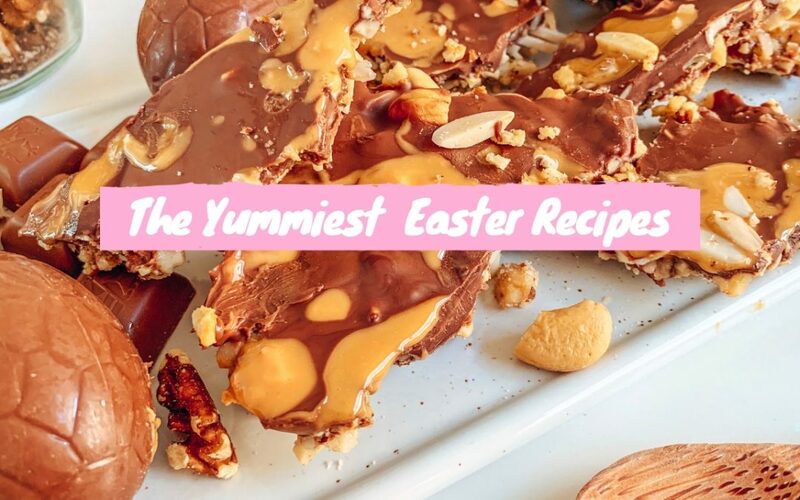 Easy and delicious, this Easter Chocolate Nut Brittle can be made into beautiful gifts for your family and friends this Easter. 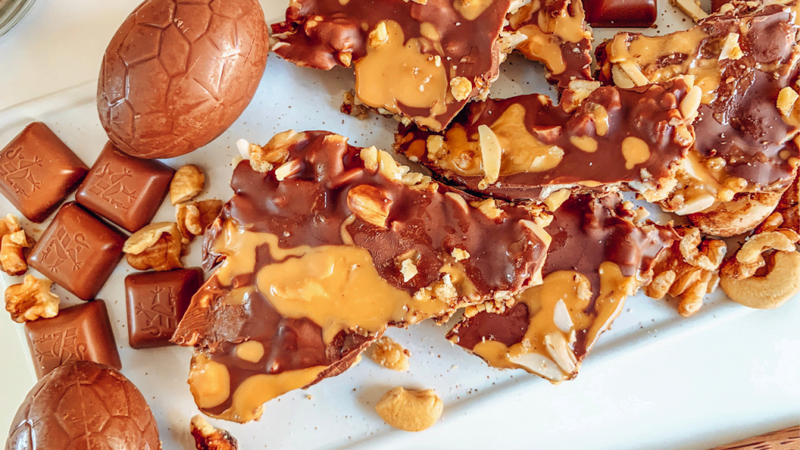 Or better yet, put your leftover Easter eggs and chocolate bunnies to good use and make them into this scrumptious Easter Chocolate Nut Brittle to snack on after the Easter festivities have finished up! Roughly crush nuts – this can be done by either placing them in a high speed blender or food processor and quickly blitzing (be careful not to make them into a nut butter), by placing them into a snap lock bag and rolling with a rolling pin, or chopping with a knife. Once crushed, evenly spread the nuts over a baking tray lined with oiled baking paper. Set aside. Melt your chocolate – this can either be done in a microwave, stirring a few times, or on a stove top using the double boiler method. Once melted, quickly pour hot chocolate evenly over nuts to completely cover. 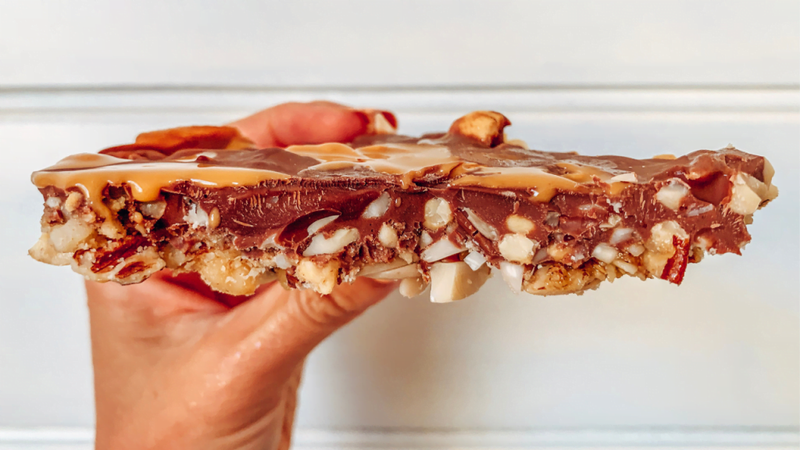 Drizzle with nut butter. Place in freezer for a few hours or overnight. Remover from freezer, lift out brittle and break into pieces. Whisk the yeast, sugar, salt and water in a bowl then set aside for 5 minutes or until foamy. Whisk in the milk, margarine and egg. Stir mixture into flour, add prunes, macadamias, sugar and mixed spice. Knead for 10 minutes. Place in a large bowl in a warm area for one hour or until doubled. Punch down dough, knead for a couple of minutes then roll into 12 balls. Place balls on a 16cm x 26cm baking tray so they are just touching. Cover in warm place again for ½ hour. Preheat oven to 190C. Mix together the extra flour and half the extra water. Pipe crosses onto the buns. Bake buns for 30 minutes. Whilst the buns are baking, simmer the sugar and remaining water in a small saucepan until sugar has dissolved. Remove buns from oven and brush with sugar syrup immediately. Editor’s Note: This post was written as part of my work with Nuts For Life. 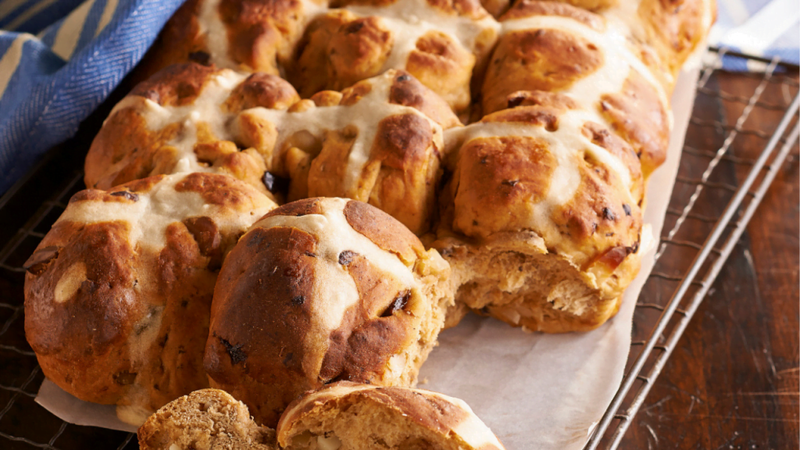 Macadamia And Prune Hot Cross Buns recipe from Nuts for Life. For more information on nuts, click here.